100 days to fight corruption. 100 days to build the movement. Together, we showed we are unstoppable. You should really see this: https://act.represent.us/sign/our-first-100-days?source=taf . RepresentUs has a smart plan to fix our broken political system. Check it out. These were our first 100 days. Corruption affects each and every one of us - and part of building this movement means spreading awareness about the way corruption impacts our lives. On April 20th, Represent.Us launched We Demand Better and shared the story of baby Amelia, who died because of corruption. 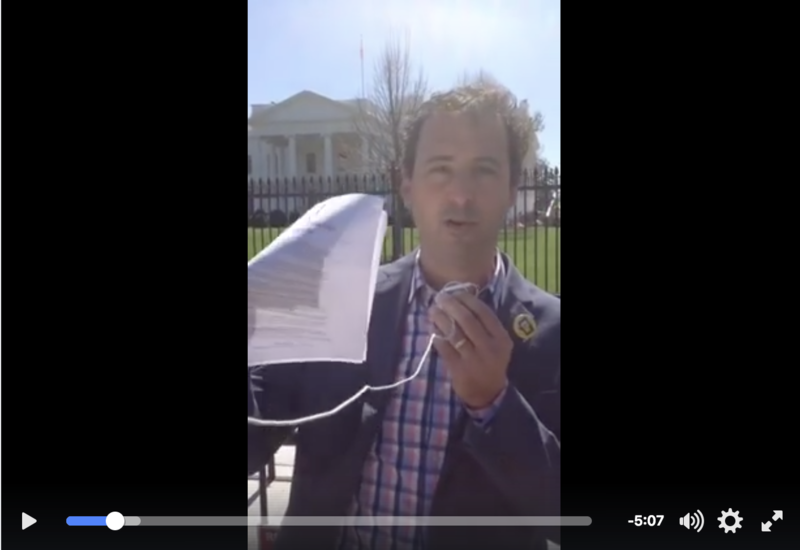 We started collecting stories from people across America to show the real-life impacts of corruption. On April 19th, the Represent Triangle chapter passed their first-ever Anti-Corruption Resolution through the Carrboro, NC city council. The team packed the room for the night of the vote and a member was able to give a presentation. The city council voted unanimously to pass the Resolution. Represent Roanoke hosted an early Representation Day event complete with music and speeches. At the event, 11 candidates made pledges to support the American Anti-Corruption Act. Dozens of community members came out to Represent Vancouver's early Representation Day event, where they dressed in money suits, played corruption tug-of-war, gave speeches and did a ranked choice voting exercise. 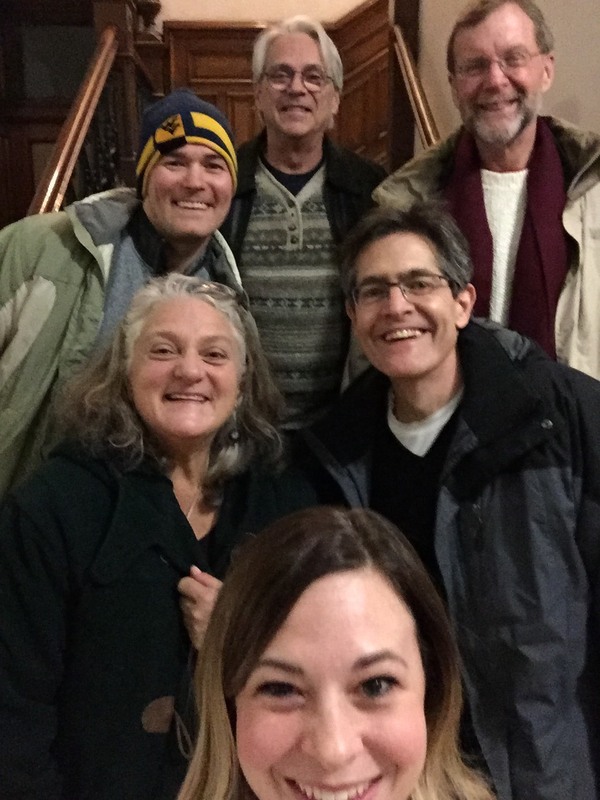 After hearing from anti-corruption organizers and coalition members, there was so much interest and excitement about the growing anti-corruption movement in Michigan that people came out to the Anti-Corruption Forum in Lansing decided to launch a new chapter. There was so much interest and excitement about the growing anti-corruption movement in Ohio that people came out to the Anti-Corruption Forum in Columbus decided to launch Represent Ohio. Victory in South Hadley, MA! Represent Western Massachusetts successfully passed an Anti-Corruption Resolution in the town of South Hadley on April 11, 2017. The Resolution passed by an overwhelming majority, proving that corruption is an important issue that Americans from the left and the right will fight to fix. Anti-corruption partners from Represent.Us, Take Back Our Republic, Clean Missouri, and Patriotic Millionaires came out to Kansas City to talk about corruption in Missouri and what we can do to address it. Members of the Represent Northeast Kansas chapter even came to make a guest appearance and talk about their efforts fighting corruption in Kansas. People of all political stripes came out to the St. Louis Anti-Corruption Forum, which included coalition partners and special guests including Paul DeGregorio, the former chairman of the U.S. Election Assistance Commission. Paul shared his inspiring story about why he got involved in politics and how he's working to promote bipartisan anti-corruption reform in Missouri and nationwide. 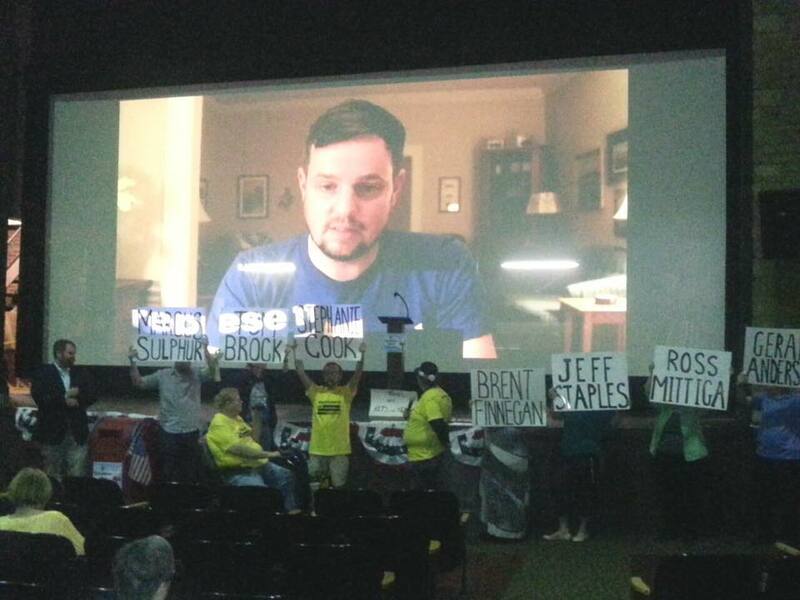 There was so much interest and excitement about the growing anti-corruption movement in Missouri that several people stepped up to start a Represent.Us chapter in St. Louis. Click here to join the chapter. Victory in Stephenon County, IL! Our all-star chapters in Illinois teamed up to pass the fifth county-wide Anti-Corruption Resolution in Illinois. On April 4th the Resolution passed with over 90% of public support, more proof that when presented with the ideas of the American Anti-corruption Act, the American people vote for reform. Halfway through the first 100 Days of the administration, there was no real action from Congress or the White House to Drain the Swamp. So Represent.Us created the American Anti-Corruption Executive Order, a model Executive Order that the President could sign to take immediate steps to fight corruption in America. We teamed up with a cross-partisan coalition including Take Back Our Republic, MAYDAY America, and End Citizens United, and delivered the Executive Order to the White House. Watch the livestream from the White House. 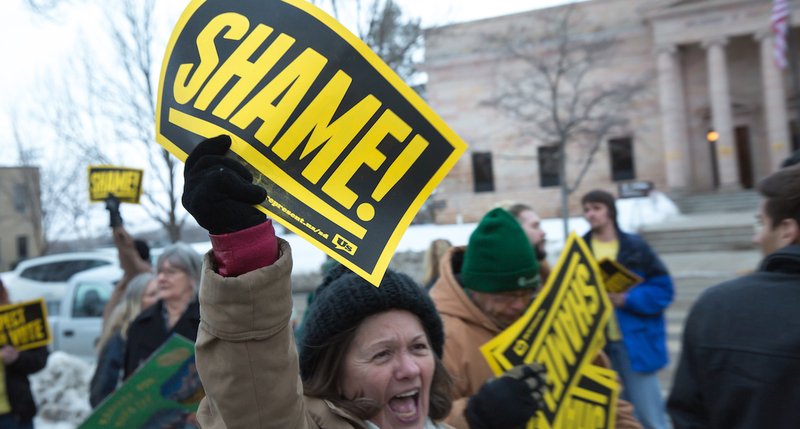 In Sioux Falls, Pierre and Brookings, Represent South Dakota members gathered to protest corruption in South Dakota. They held marches and forums, and started planning the next steps of the grassroots campaign to fight corruption that would ultimately lead to the new Voter Protection and Anti-Corruption Amendment, which was filed in April. Represent Boston chapter members passed their first Resolution of 2017 on March 22nd in Lexington, Massachusetts. At the March town meeting voters overwhelmingly approved an Anti-Corruption Resolution, which demands that anti-corruption laws be passed by the legislature at the state and federal level. Represent Northeastern Pennsylvania passed their third resolution of 2017 on March 22nd. The City Council of Pittston unanimously voted in support of an Anti-Corruption Resolution that calls for reform at all levels of government. Represent Central New Jersey passed their 5th Anti-Corruption Resolution on March 13th. The Resolution calls on the mayor of Princeton, Liz Lempert, to send a letter of support for three bipartisan campaign finance reform bills in the New Jersey Assembly. The letters will be sent to the members of the 16th district of the New Jersey State Legislature along with the executive officers of the New Jersey State League of Municipalities and the New Jersey Conference of Mayors. On a blustery Friday afternoon in Boston, people came together at the capitol building to deliver a corruption report card to the legislature and tell local and national lawmakers that We Demand Better. 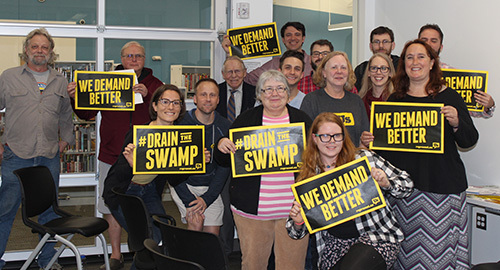 Dozens of people from the Boston area came out to the first of a series of anti-corruption forums hosted by Represent.Us, with guest speakers Rob Booth and Dan Krassner. The forums gave an in-depth overview of the problem of corruption in America, how people can get involved locally, and what people in Massachusetts can do to get ready for 2018. Victory in Luzerne County, PA! Represent NEPA (Northeastern Pennsylvania) passed their second Anti-Corruption Resolution this year in Luzerne County by a 10:1 vote. The Resolution called for city, state, and federal anti-corruption reform, and is proof of how a small dedicated team can make a difference at the local level. 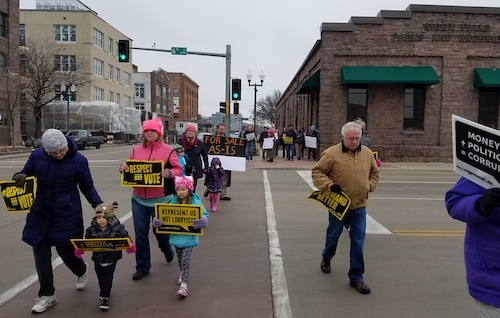 South Dakotans came from all over the state to protest the brazen repeal of America's first statewide Anti-Corruption Act. They made hundreds of calls and sent thousands of emails to lawmakers prior to the vote. On February 1, Represent.Us members rallied at the state capitol, packed the Senate gallery, and protested afterward. Because of the pressure they put on politicians throughout the repeal process, lawmakers made public promises to replace the Anti-Corruption Act. Instead, they've introduced laws that actually increase special interest influence. Represent South Dakota is fighting back in 2018. To join a chapter and learn more, click here. On January 12, Represent Northeastern Pennsylvania passed the state's first Anti-Corruption Resolution and the first Resolution of 2017! The Resolution calls for city, state, and federal anti-corruption reform, and was the product of a months long campaign by Represent NEPA members. 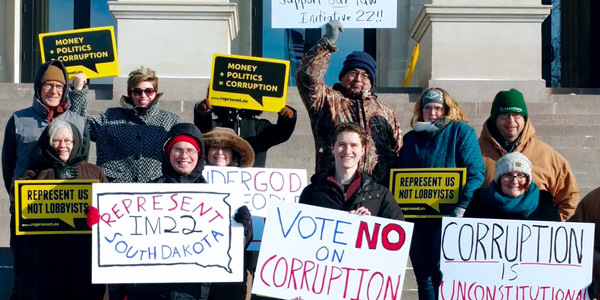 Politicians in South Dakota had announced plans to dismantle the Anti-Corruption Act when they started the legislative session in January. Represent South Dakota fought back, taking out full-page newspaper ads shaming the politicians attacking the will of the voters; releasing a video about two of the leaders of the opposition; and just before the session started, gathering from all over the state gathered outside the capitol building, carrying signs and shouting "Respect the vote!" Reporters came to the protest to interview Represent.Us members and the repeal of the Anti-Corruption Act became the top news story in South Dakota for the months that followed. 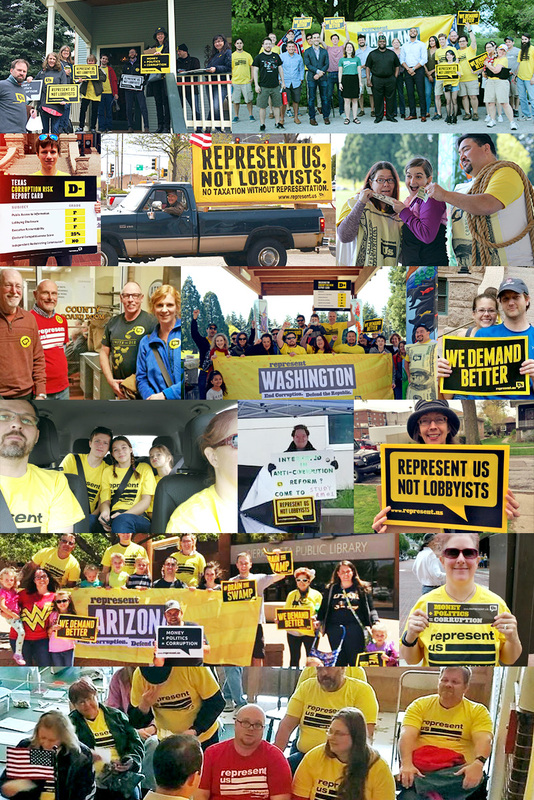 Inspired to fight corruption alongside thousands of Represent.Us members? Join now to be part of this historic movement.